An incredible Ojuela Cerussite that is a mix of colorless, green and nearly black Cerussite crystals with minimal matrix of Sulfides, mostly Pyrite. From a find about 5 years ago there were not many as fine as this. Slender, flattened and blocky prismatic habits with and without twinning in exceptional condition. The quality is amazing for this delicate mineral. The darkest Cerussites are included by a dark Sulfide, probably Galena. 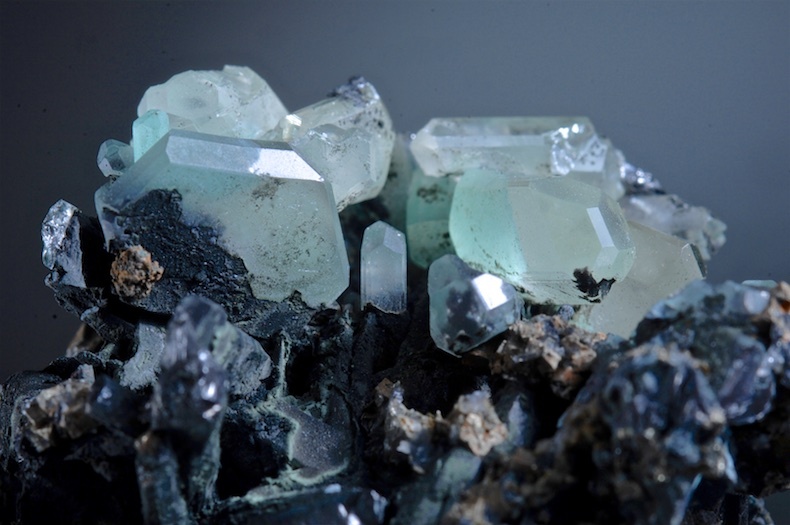 The green-blue color is an especially nice touch when seen on the clearest crystals. This could be trimmed to a killer miniature but the overall specimen seems to have greater mineralogical interest if kept intact. A killer Paradamite with outstanding color, form and with contrasting Smithsonite. Paradamite is a very rare mineral and choice pieces are not often available for less than a small fortune (sometimes even a large one) From the recent find, this has the best glassy luster, several crystal habits showing and the quality is top. The last good find of Paradamite was almost 20 years ago, and disappeared right away. 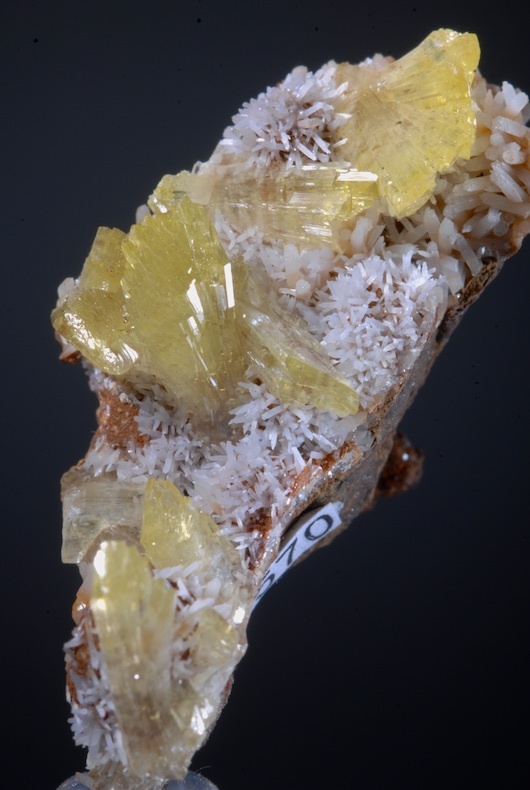 The rare coper mineral Kobyashevite was discovered and described in 2011. A close relative of Devilline this Copper Sulfate specie was an exciting find at Mina Ojuela this year, and in this deposit the specimens are impressively large and attractive, certainly the worlds best. 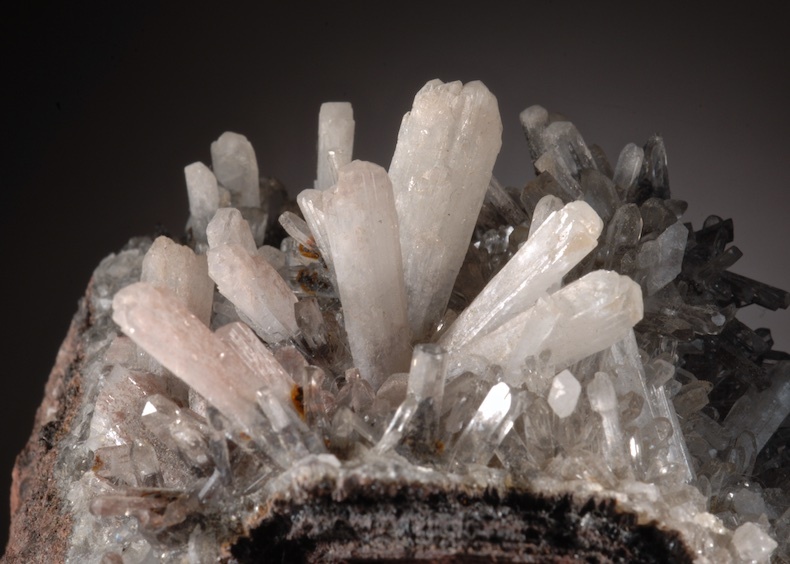 It seems that these specimens are postmining redepositions and are always partly overgrown with small needles of clear Selenite. 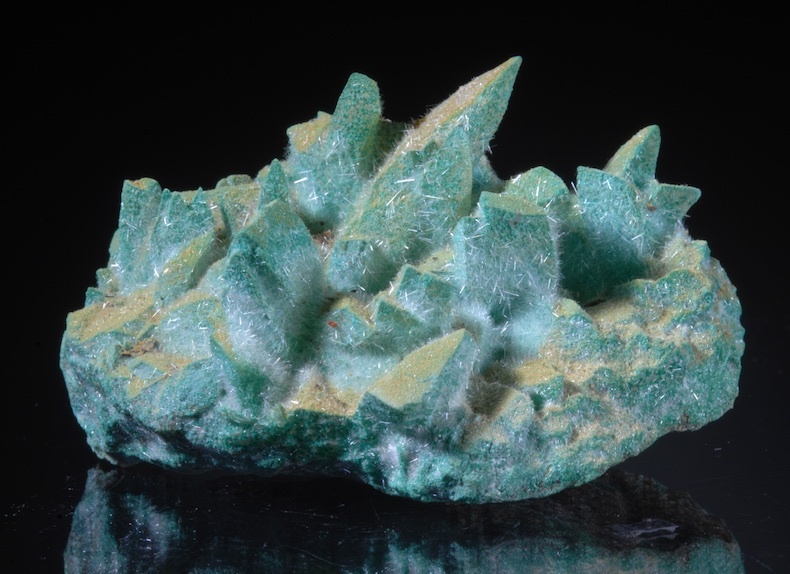 The best examples have a rich blue-green or Turquoise color and when this is deposited on calcite crystals these have a very esthetic presentation. This specimen is in excellent condition and is the most attractive I have seen from the find. A choice and colorful rarity. 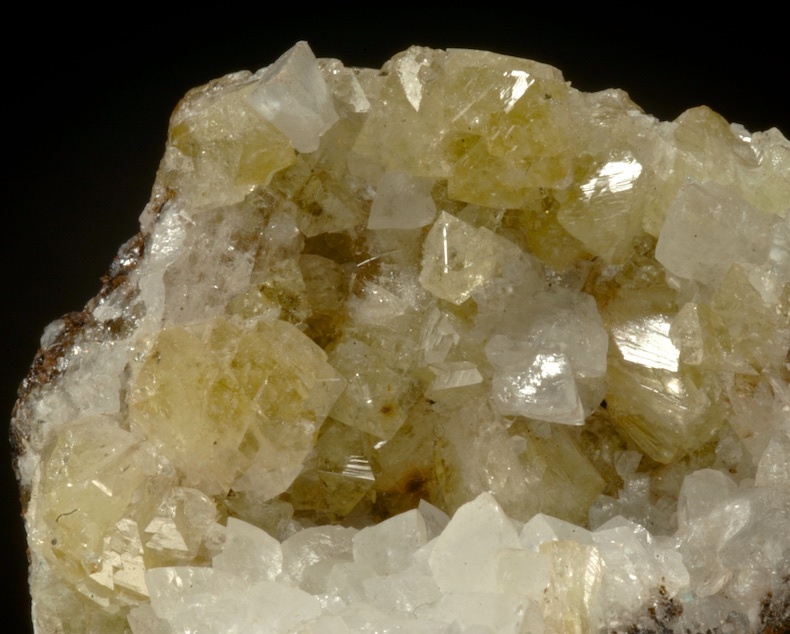 Two generations of well-formed Hemimophite crystals on a gossan matrix. The smaller crystals are colorless, glass clear and very lustrous. The larger are a milky white with a hint of reddish included Hematite. Free standing, these larger crystals reach 2.5 CM. 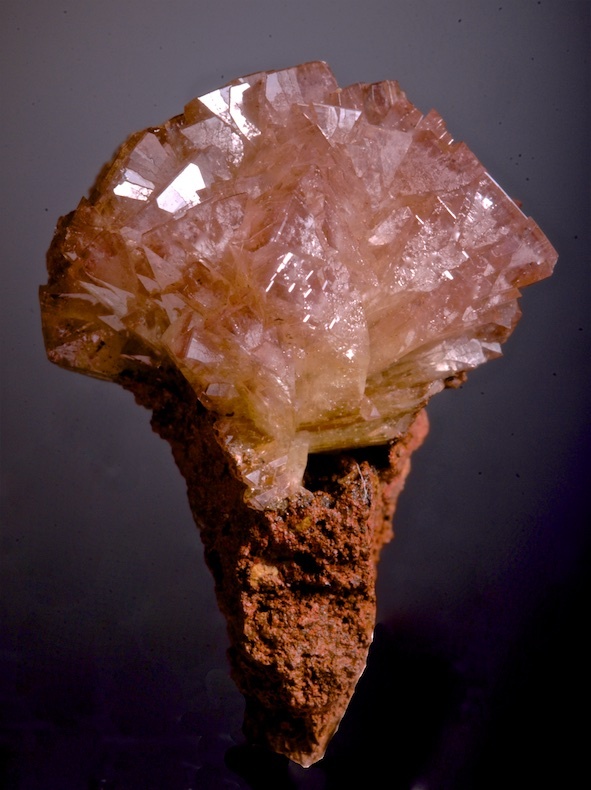 A very three-dimensional matrix and with several excellent angles for display, this is an older Mina Ojuela specimen that is not like material from later finds. The early finds are highly respected as perhaps the best prismatic crystals of the specie ever found. A modern Mexican classic that is still affordable. 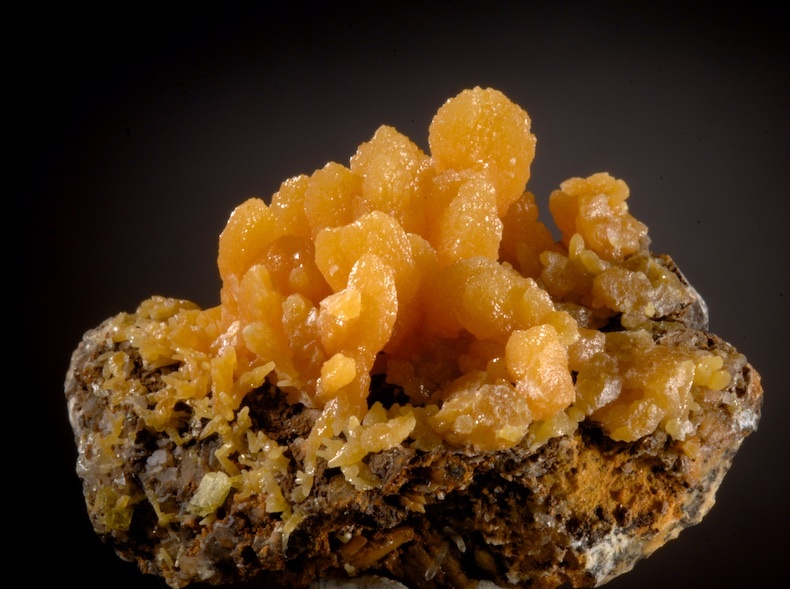 A choice "wet-look" Mimetite with bright yellow-orange color. In fine condition as seen, from the 2012 pocket at Mina Ojuela, one of the best discoveries there in many years. The form is noticably different from the old San Pedro de Coralitos locality that is now very uncommon and expensive. On this piece the luster and color is noticably brighter, while the Mimetites are more tall and slender. Bright and attractive piece with some tiny Wulfenites scattered about that are best seen with magnification. Excellent value. 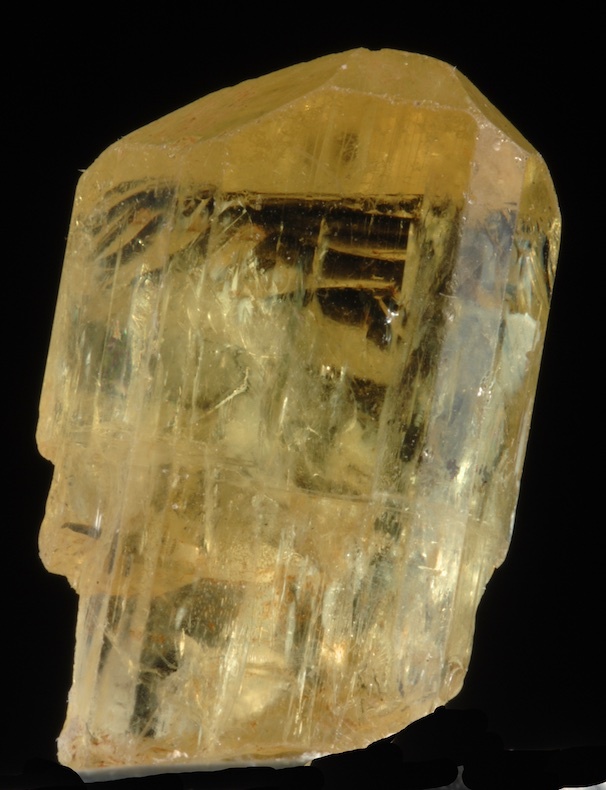 Sharp, clear, bright yellow and lustrous a choice Apatite from the famed Cerro de Mercado. This Durango locality has produced vast numbers of Apatites for decades, but despite the numbers the better pieces stand out as choice specimens and one of the best values for a good quality gem crystal. This is that sort of value, well above average color and clarity, simple, pretty and relatively affordable.